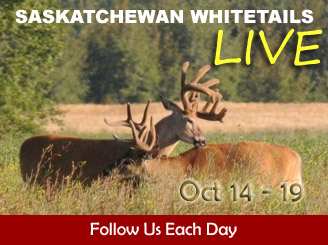 We're back hunting with Rob Nye, of Rob Nye's Wilderness Adventures and Canadian Trophy Quest located near the Carrot River area of Northern Saskatchewan. We'll be bowhunting trophy-class bucks from a combination of both baited and unbaited stand locations with some hunts running sunrise to sunset. 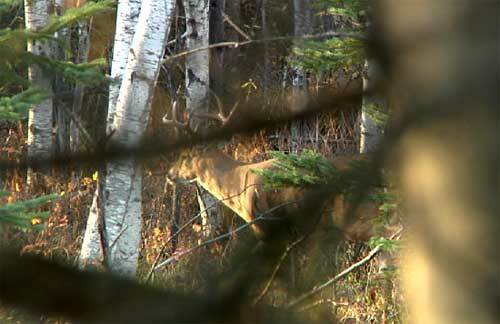 Like last year this hunt takes place during the archery season. A buddy of mine, Greg Hammell joined me this year. 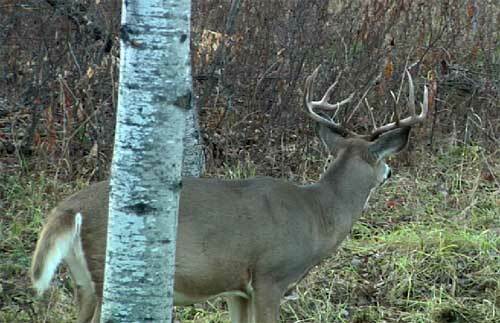 If I tag out early I'll likely film his hunt too. Note, the internet connection up here is terrible this year. We will do our best to upload as much as possible. Hopefully it doesn't go down during our hunt. I am hunting a new stand, but in an area I hunted last year. The weather turned nice, It was in the fifties with clear skies and a light winds. We dropped Greg off first and wished him luck. Rob then took me to a farm not far from the lodge where I would sit from Noon until dark. The stand was terrific. It was a two-person stand buried into White Spruce tree. I had tremendous cover and a nice 20 yard shot. It was slow during the mid day but things heated up during the last two hours. A young 8-point walked by and followed two does to the fields to the west. An hour later a small buck came from behind me and headed in toward the bait. He fed for a few minutes until another deer came from behind me. I knew it was going to catch my wind and it did. He ran back into the brush and stomped a few times. I couldn't see what it was, all I could make out was a form in the brush. He stood there for a few minutes and came in anyway. That's when it got interesting. He was a Great buck! He had good mass, good width, good tine length and was at least 3.5 years old. He was a mainframe 10 with a forked G3. I started thinking about all of my past hunts here and determined that he was probably just a little smaller than the buck I killed last year. 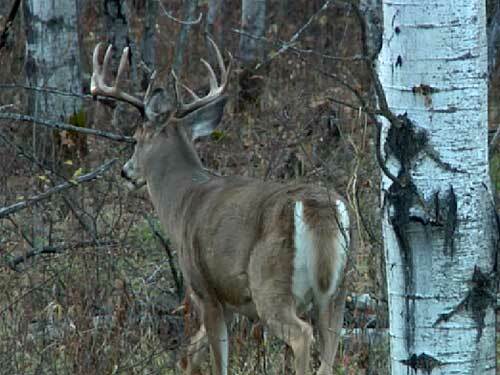 Easily the 2nd best buck I'd seen here and a shooter for just about anyone. But there was a problem. It was only day one and I hate tagging out on day one. I talked myself out of him and watched him with my Minox binoculars for 20 minutes. When he walked off I knew I may regret the decision. This hunt is too much fun to end this early. A great start to our hunt. 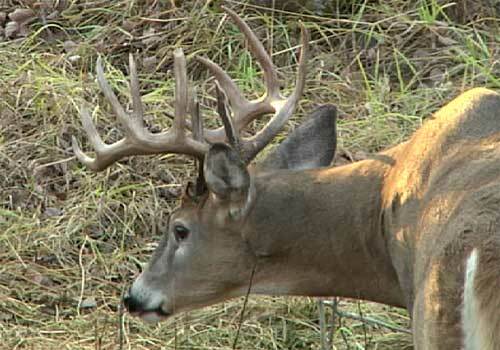 In the meantime, check out the buck we killed here last year. 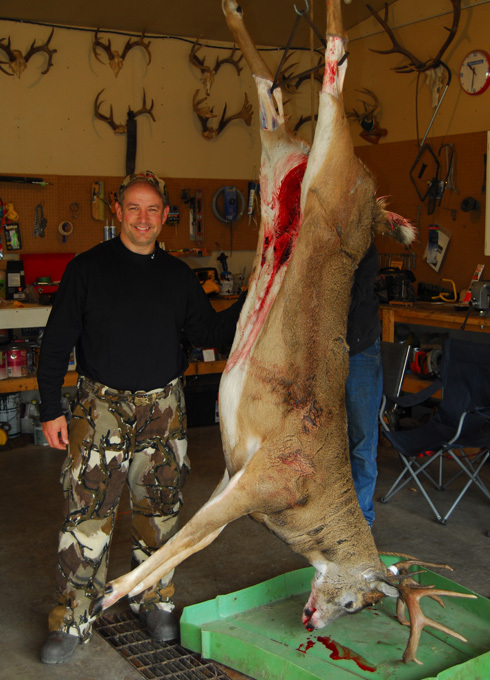 It Grossed 155 and at 304lbs was the biggest bodied deer I'd ever killed. It was a fantastic hunt and we're looking forward to reliving the excitement again this year!